Finally! Okay, now we’re in business. I don’t want to necessarily say that the news is big news; I think a year or two ago it would have been really big news, but players age year to year, and last year’s phenom is this year’s solid, all-around acquisition who’s good but doesn’t necessarily have that wow factor anymore. But given our needs and our situation, I’d say Ben’s moves during and after the Winter Meetings were good and much-needed ones. He’s putting together a stable team while maintaining a healthy amount of financial flexibility, and John Farrell is happy with the developments. All in all, I’d say we’re definitely going in a great direction. Anyway, let’s get down to it. We’ve signed Mike Napoli to a three-year contract worth thirty-nine million dollars. Don’t let last season’s aggregate stats fool you. He batted .227 with twenty-four home runs and fifty-six RBIs with an on-base percentage of .343, but look at his numbers in his new home: .307 batting average, nine home runs, twenty RBIs, and a 1.14 OBP. Admittedly, the sample size of seventy-five at-bats is small, but numbers aside, he’s known for pulling the ball, and his swing will thrive in Fenway. As for defense, he’s a catcher by trade, but don’t expect to see him behind the plate. He’ll probably end up at first. Our next name is Shane Victorino, the Flyin’ Hawaiian. It’s another three-year, thirty-nine-million-dollar deal. Last year, he batted .255 with eleven homers, fifty-five RBIs, and a .321 OBP. Don’t forget that he bats switch, though, and while he batted .229 as a leftie, he batted .320 as a rightie. But he had vastly more at-bats from the left than the right, so again, the sample size must be considered. Still, versatility has never been frowned upon in our organization. 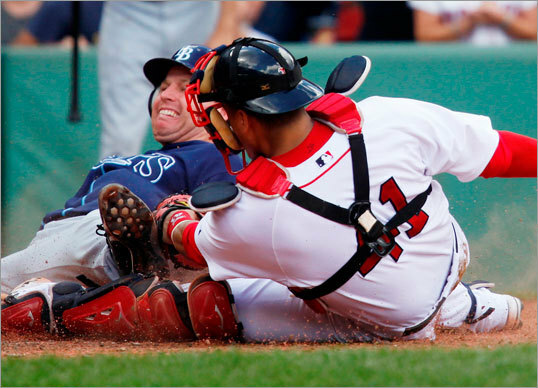 As for defense, like Napoli, Victorino will not field in familiar territory. All trade rumors concerning Ellsbury are patently false, and Victorino will not be playing center. He’ll be playing right for sure. And it’ll be a welcome relief. Fenway’s right field can break any veteran, but Shane has the stuff to handle it. He has three Gold Gloves and a center fielder’s speed and arm, and that combination in right, once he learns the fatal angles out there, will be formidable. It’ll be nice breathing easy with a steady patrol out there. It’s worth noting that Ben and John met in person with Josh Hamilton, but don’t get too excited. We already have Ellsbury, and Hamilton wants either Texas or a long-term deal, neither of which we will provide. And we signed Ryan Dempster to a two-year deal worth $26.5 million. Granted, he has spent almost all of his time in the National League aside from a few handfuls of games last season, which he started for Texas. But his ERA was 3.38 last season, and his WHIP was 1.20; not too shabby. Just as important, if not more important, to why we were interested in him in the first place is the fact that, before last season, his last for seasons totaled at least two hundred innings, and last season he clocked 173 innings which isn’t too far behind. That means three things: durability, durability, durability. On the other hand, durability doesn’t mean much unless you’re good, and his brief stint in the American League didn’t go well at all, so I’m concerned as to how he’ll make out in the AL East, which, as we all know, is the toughest division there is, basically. So I’d say we can approach this one with cautious expectations. But at least we got some sort of starting pitcher, which is a step in the right direction. We also added Koji Uehara, who signed a one-year deal. In thirty-six innings last year, he posted a 1.75 ERA and an 0.64 WHIP. That means good late-inning work for us. We finished the Zach Stewart trade by acquiring Kyle Kaminska from the Pirates and assigned him to the PawSox. We also claimed Sandy Rosario from the A’s, and he has since been claimed by the Cubs. Gary DiSarcina, formerly the Angels’ minor league field coordinator, is now the PawSox manager. So we had gaps and voids, we identified them, and we set about filling them with solid, stable choices who will fit in both on the field and in the clubhouse. We now have some powerful hitters and defenders in the lineup whose numbers admittedly were not great last year but who stand, given the right circumstances, to do great things, and we have some great additions to the clubhouse as well. We also have a starter who’s spent hardly any time in the AL and whose time he did spend in the AL was nothing to write home about but who has considerable potential. We still have a lot of work to do; we need more and better starting pitching, for one thing. That’s a big one. But slowly but surely we’re getting it done. We don’t need to make the world’s biggest splash to put a team together that can go the distance. In other news, the Pats beat the Dophins, 23-16, and the Texans, 42-14. This week was basically all about options. If we weren’t busy exercising somebody’s option, we were busy declining somebody else’s. Hey, why not? They’re basically cheap locks; it’s a good way to keep a guy on board for minimal funds and minimal years. That translates to flexibility, which is always a good thing. Plus, it postpones contract negotiations, a solid strategy if you’ve got a lot on your plate during a particular offseason. Case in point for that last one: Victor Martinez. We exercised his option to bring him back as our starting catcher. No surprise there. And it’s no surprise that locking Victor Martinez for the long run is a top priority. But that’s going to be a big project, so keeping him under contract until we can hammer out a new one is a good strategy. The option effectively means that there’s no rush. 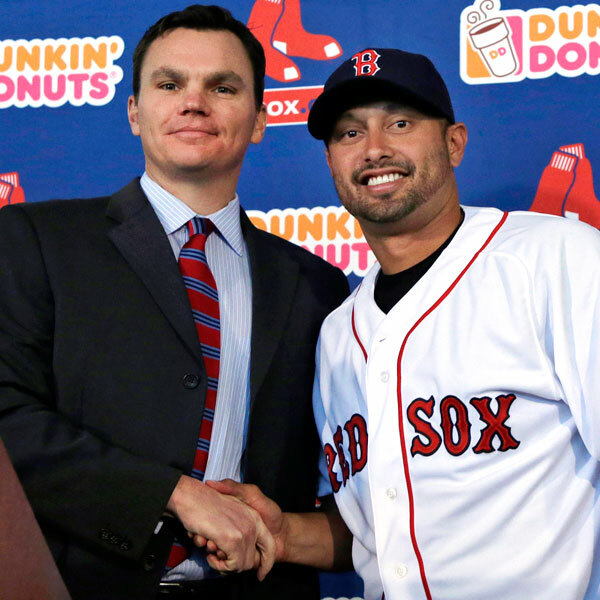 Expect Martinez to be back in a Boston uniform for the first of many years in 2011. Although the arrival of Joe Mauer in the free agent market could potentially make that interesting. It would probably play into our hands, being that Mauer will likely steal the show that year, leaving Martinez and us to take care of business. Speaking of catchers, we declined our five-million-dollar option on Tek, but he picked up his three-million-dollar option, which includes another two million dollars’ worth of incentives, so our captain is coming back as a backup for three million dollars. Not too bad, I’d say. In terms of the role he plays on this team, there’s no better backup catcher out there for us, and being that he still has something left in the tank, it’s a pretty good deal. Wakefield is coming back, folks. Our deadline to pick up his option was Monday, and we agreed to a two-year deal with incentives that could boost the value of the contract up to ten million. Within those two years, he’ll likely reach two hundred wins and 193 wins in a Red Sox uniform, a total that would break the current franchise record, held by both Roger Clemens and Cy Young. Make no mistake: Wakefield would definitely be deserving. How many other starting pitchers out there accept less money in favor of a tenure with a team that hadn’t won the World Series in almost a century, then voluntarily removed himself from the roster of the second World Series that team would go on to win because he felt he wouldn’t perform as well as another pitcher? Not many. Believe that. We declined our option on Alex Gonzalez, which was expected, but we’re still interested. That’s also expected. Jed Lowrie’s wrist sidelined him for essentially the entire season last year, and we need not just an everyday shortstop, but an everyday shortstop we can depend on. That’s a luxury we haven’t had since Nomar wrote his one-way ticket out of town. And with the improvement in offense he showed last year, Gonzalez would be a great fit. Of course, what this gesture shows is that he’ll have to come at the right price. Otherwise Theo won’t bite. That’s basically all the news so far. The GM meetings ended on Wednesday, so aside from these moves and Jeremy Hermida, we’ve been pretty quiet, but I don’t think that’ll last long. Before the meetings ended, Theo met with John Lackey’s agent. Smile, Red Sox Nation; Scott Boras is not John Lackey’s agent. Free-agent negotiations with other teams start on Friday, so it’s likely he’ll be inundated with offers, but I could see us being a big player there. We’re also supposedly interested in Dan Uggla; apparently there is potential in turning the second baseman into a left fielder. Frankly, I don’t see that playing out. Congratulations to Jason Bay, who won his first Silver Slugger! And that functions as even more of a reason for us to sign him. I think we’ll focus our efforts there before we start turning infielders into outfielders. In addition to options, the other big story at this point is arbitration. We’ve got eight guys eligible: Casey Kotchman, now Jeremy Hermida, Ramon Ramirez, Fernando Cabrera, Brian Anderson, Hideki Okajima, Manny Delcarmen, and, you guessed it, Jonathan Papelbon. The arbitration process will probably be more or less smooth sailing for the utility guys and the no-doubts, the players who have clear bargaining power due to their consistently good performances. I’d put Ramon Ramirez and Hideki Okajima in the latter category. As far as Manny Delcarmen is concerned, his second half was just bad, so he’ll probably take some sort of cut. Jonathan Papelbon will be quite the case; I’ll be very interested to see how that goes. He obviously packs a lot of bargaining power, but there’s also no ignoring the fact that his walk total was up and his postseason performance was…well, let’s not go there. Let’s just say he’s less able to pull off the I-should-be-paid-Mariano’s-salary routine this time around. 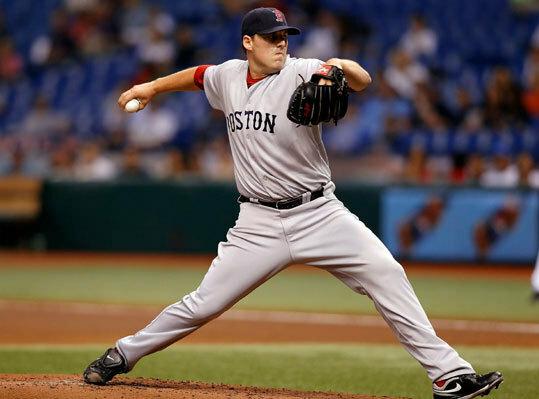 Especially because Daniel Bard is coming on strong and Billy Wagner has stated that he might be open to an arbitration offer that would bring him back to Boston next year. Let’s face it: he wants a ring, and in this day and age ballplayers who want rings come to Boston. Nick Green and Joey Gathright have opted to file for free agency rather than accept minor league assignments. Green had back surgery at Mass. General on Monday, by the way, so he’s facing an uphill battle as far as market value goes. Dice-K is going to begin his conditioning program early this year. Thankfully. Finally. I think I speak for all of Red Sox Nation when I say that we’re ready to see him ace this year. Or at the very least spend more time on the roster than on the disabled list. Theo and Tito are in the throes of their search for a bench coach, and they’ve narrowed it down to four: PawSox manager Ron Johnson, Lowell Spinners manager Gary DiSarcina, minor league field coordinator Rob Leary, and outfield and baserunning coordinator Tom Goodwin. Promoting from within. I like it. Really, there’s no better way to ensure that a new member of the coaching staff knows the franchise and the players; many of the players currently on the team have played for these guys in their younger days. We’re biding our time but staying in the loop. I think there’s a potential for a serious blockbuster deal this offseason. Whether it’s Lackey or Adrian Gonzalez or someone else, I don’t know. I’ll leave that to the front office. At this point, so much is kept under wraps that it’s hard to know exactly who we’re pursuing first or what our main focus will be. But I will say that either of those guys would have a hugely positive impact on our team. We’ll have to wait and see what happens, I guess. It’s a long winter; the speculation keeps us going. That’s just what the offseason is all about. The Bruins played three games this week. We shut out the Penguins, lost to the Panthers in a shootout, and lost to the Penguins in sudden death. The Sabres lead us in the division by five points, but at least we’re ahead of the Habs. The Pats beat the Dolphins.